X Productions. 1981. Director: Haydn Keenan. Music Co-ordinator: Kim Chesire. 45	(ST)	EMI Custom. 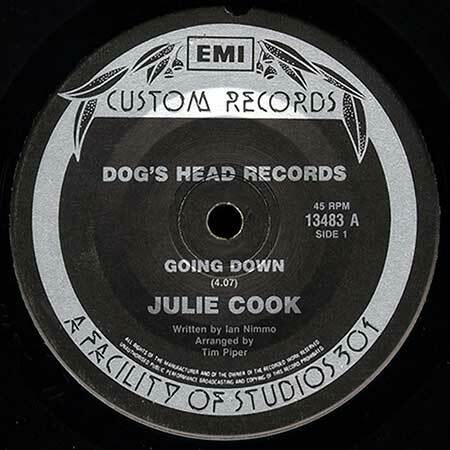 Dog’s Head Records. 13483. 1983. Side a: “Going Down”. (4:07). v: Julie Cook. Written by Ian Nimmo, Arranged by Tim Piper. Side b: “The Blues”. (3:30). v: Julie Cook. Written and arranged by Tim Piper. “Going Down". v: Julie Cook. 45	(OP)	EMI. MX 63307. 1983. Promotional release only. “What’s It Like”. v: James Reyne.